Experimental composer and director Heiner Goebbels was born in Neustadt, Germany, on August 17, 1952, relocating to the Frankfurt area at age 20 to study music and sociology. He first achieved recognition in 1976 upon premiering a number of works, including "Rote Sonne", "Circa", and "Improvisations on Themes by Hanns Eisler", most performed in conjunction with the "Sogenanntes Linksradikales Blasorchester". Concurrently, Goebbels also collaborated with Alfred Harth and, beginning in 1982, he served as a member of the longstanding art rock trio Cassiber. He further expanded his growing oeuvre with a series of theatrical, film, and ballet scores, and during the mid-'80s began writing and directing audio plays of his own, seeking his initial inspiration in the texts of Heiner Mueller. His theatrical and musical works have won numerous awards across Europe. "Bertolt Brecht - Zeit wird knapp" is a collaboration of Heiner Goebbels with Alfred Harth, Dagmar Krause and Ernst Stötzner. It was recorded and mixed between August and October 1981 at "Tonstudio Zuckerfabrik" in Stuttgart.Germany. It came with a 16 page text-booklet and was available only at "2001 mailorder", Frankfurt. 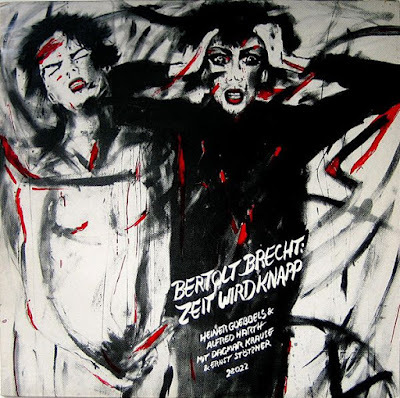 The album combines the poetry of Bertolt Brecht with free jazz and free improvisation. Heiner Goebbels plays piano, cembalo, synthesizer, cello, guitar, bouzuki, bass; Alfred Harth plays saxophone, clarinet and flute; Dagmar Krause and Ernst Stötzner supplied their voices. Hoping a lossless reup somewhere in net , i listen all goebbels/harth/anders musical universe. Hey, that would be great! Any Goebbels/Harth music in better sound quality would be great! Thanks in advance. Thanks a lot, Otto, for your friendly help! Best wishes!